Can Canada continue to commit what is an enumerated act of genocide by the UNGC [United Nations Genocide Convention] and excuse itself by continuing to say that it is not intending what the Genocide Treaty recognizes as the result of such an act… ? Genocide is a heinous crime that fractures and dehumanizes humanity. Science tells us that we are all taxonomically Homo sapiens. Yet most of us tend to divide into Us and Them groupings, sometimes leading to in-group and out-group competition that can turn violent. In the worst cases, the monstrous result is the decimation of the different group. The carrying out of a genocide doesn’t require annihilatory bombing or the mowing down of a particular targetted group. Neither does genocide require a lightning temporality in execution. Genocide merely requires the intent to bring about the destruction of a targetted group by whatever manner, unbounded by a specific timeframe. Humans steer genocide: a malicious force capable of an evil genius in linguistically guising its execution, as well as being capable of extreme patience in achieving its pernicious aims. A particular example of an under-the-radar genocide is that carried out by European settler-colonialists who denationalized all the Original Nations of the western hemisphere. There are non-indigenous people who are aware and acknowledge that genocide occurred, but few would realize or acknowledge that the genocide continues. 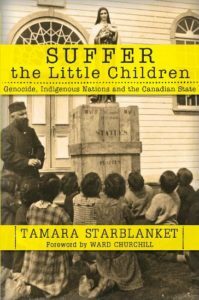 That is much of the importance of Tamara Starblanket’s Suffer the Little Children: Genocide, Indigenous Nations and the Canadian State (Clarity Press, 2018). Suffer the Little Children details the Canadian state’s Indian Residential School (IRS) program — a policy whose intent was the disappearance of Indigenous peoples. As such it constitutes genocide. Moreover, by prefacing the genocide with the descriptor “cultural,” as in cultural genocide, the destruction seemingly points to the abstraction of culture, thereby eliding the lethal effects on humans. One narrative, however, is largely controlled by the state and dependent media. A stark example is the “apology” read by then Canadian prime minister Stephen Harper about the “sad chapter” of the IRS. The Canadian government apparently attempted to burnish its image based on the goodwill and generosity demonstrated by the Truth and Reconciliation Commission in South Africa. In South Africa, the TRC was establised by the people who survived the apartheid regime — not by the oppressors. Unlike in South Africa, the Canadian TRC was set up by the colonial-settler political estalishment. Starblanket states her purpose explicitly: “The application of the law to show beyond a reasonable doubt, to say nothing of a preponderance of evidence, that the Canadian government is culpable for crimes of genocide.” (p 244) After reading Suffer the Little Children, it is difficult to rationally or morally reach a different conclusion. The book is bold and well-argued, and it should be read widely; however, a few points vexed me. 2) Starblanket cites academics David MacDonald and Graham Hudson who state that there have been few occasions for Canadian courts to consider the Genocide Convention in criminal proceedings. (p 211; See David MacDonald and Graham Hudson, “The Genocide Question and Indian Residential Schools in Canada,” 2012. PDF: p 14.) Suffer the Little Children has not cited Bruce Clark, PhD in comparative law,6 who has doggedly (some may say overzealously; but how can one be overzealous in fighting against genocide?) attempted to pursue the matter of genocide in Canadian courts where he and his clients have been stymied by the legal system’s Catch-22. This is missing from MacDonald and Hudson’s paper and Starblanket’s thesis. It seems pertinent. The Original Peoples had lived on Turtle Island for millennia when the Europeans first reached the continent’s shores. The Europeans brought with them their supremacist notions and dehumanized the Original Peoples as savages and heathens. Preposterously, the colonial-settlers considered that this gave them the right to dispossess the First Nations and wreak a genocide. First Nations’ children were kidnapped and indoctrinated into the White man’s ways. Today, the dispossessed remain dispossessed and the genocide continues within the child welfare system. The solution (the only solution according to the author) to the injustices lies in Indigenous peoples ridding themselves of the yoke of colonial dispossession and seizing what is their sovereign right to self-determination. I concur. For those not already aware (and those who wish to deepen their knowedge), read the book and stand in solidarity against the crimes that are committed against Original Peoples and their nations. This article was posted on Thursday, August 9th, 2018 at 3:00pm and is filed under Book Review, Canada, Colonialism, Genocide, Legal/Constitutional, Original Peoples.